In Australia, we love living an outdoor life; it’s in our DNA. Parts of the country provide the opportunity to entertain and enjoy the outdoors in all months of the year; other areas are seasonal. But you can bet most Australians will want to spend as much time as possible communing with the outdoors. For some, this means a balcony in an apartment building. For others, it’s a patio, courtyard or small garden. Australians love their gardens so whether it’s a small garden or a large garden, like mine, the entertaining areas, the plants, the lawn, the pots, the pool…it’s all important and adds to our relaxed outdoor living. Over the next months, I’ll be adding more articles in the Outdoor Living section that reflect living an outdoor life; there is SO much to cover. 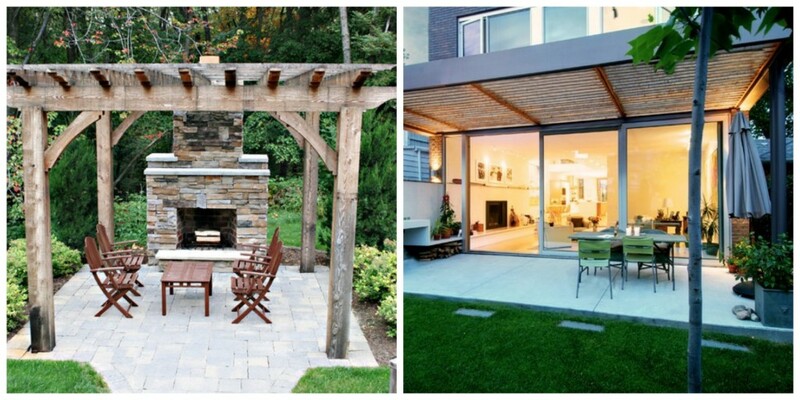 For now, here are some ideas about how to use outdoor living spaces. Seating is mandatory because you’ll want to sit with friends or read a good book. Look for sturdy and weatherproof fabrics or ensure you have a garden shed or storage to stow away cushions. There are so many weatherproof options including lounges, chairs, hammocks, and outdoor bean bags. Try Zanui for outdoor furniture that’s stylish AND hardwearing. Tables could be a dining table, wine table or flexible ottoman, depending on the space and number of guests. Personally, I like an ottoman as they can be used for seating OR as a table top. Very flexible. Temple & Webster outdoor dining sets will suit every budget and every style of home with rattan, wood, wrought iron, polywood, aluminium, and more. 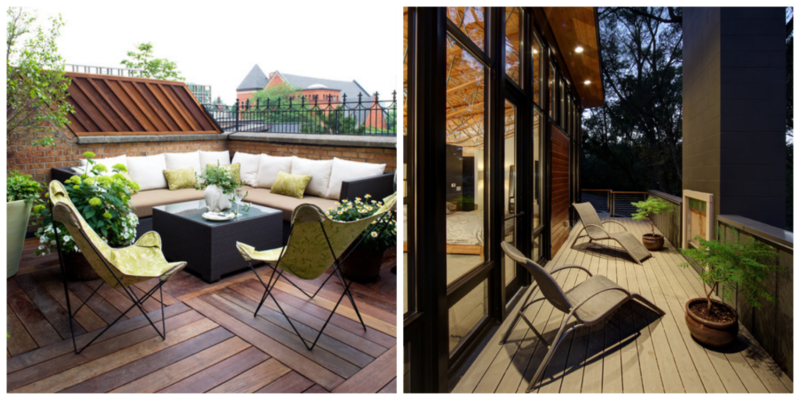 Living an outdoor life means using your outdoor space the way YOU want to use it. That will likely include a BBQ or outdoor kitchen – certainly ready access to food prep and refreshments. If you don’t have space or the desire to go ‘full outdoor kitchen’ maybe you can create easy access to your indoor kitchen. Perfect for entertaining, add a wine fridge or wine rack for storing refreshments. SAVE up to 62% with Deluxe Products who will ship wine fridges the next day (or same day in Sydney) and offer free transit insurance and a 30-day money back guarantee. 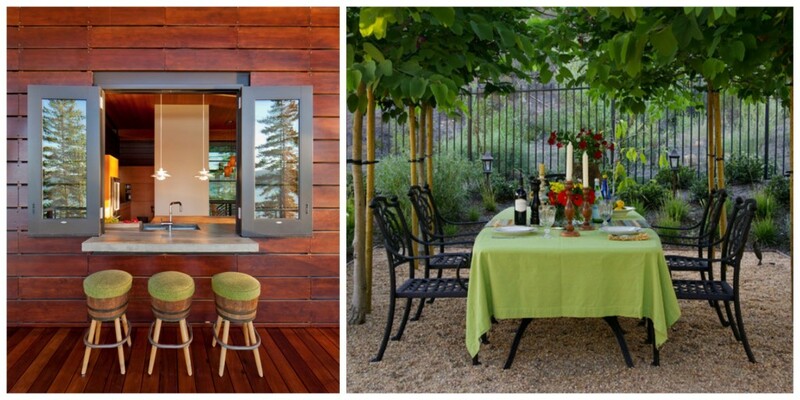 Like the image below left, we have a large kitchen window perfect for creating an outdoor bar with stools. It’s also a very cool part of the garden in the heat of summer, and it overlooks a refreshing pond. Otherwise, trees can provide the perfect canopy for a dining setting. This type of indoor/outdoor window is so handy for delivering drinks and refreshments, so it’s the perfect place for a zip hydrotap. Have cold, sparkling, or hot water at your fingertips… literally. If you either don’t have a lot of trees or need to delineate the dining area, then a pergola is perfect. Building a pergola attached to the house provides shade from summer sun and protection from light rain. It’s a great alternative if you don’t have a lot of trees. However, if you live somewhere that has balmy nights most of the year and you’d like to be more ‘at one with nature’ then an open pergola set amongst trees with a fire, gas or log firepit or BBQ firepit is the way to go. If you are lucky enough to have space for a swimming pool, and the time to keep it clean, then you probably spend even more time outside. 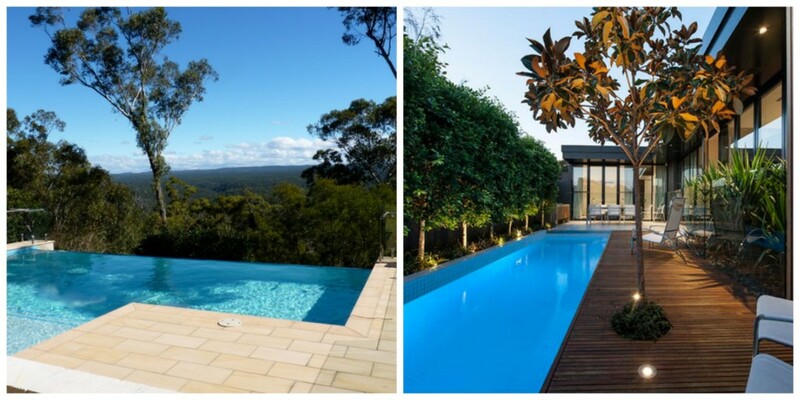 Swimming pools are also very much part of living an outdoor life in Australia when a beach isn’t handy. 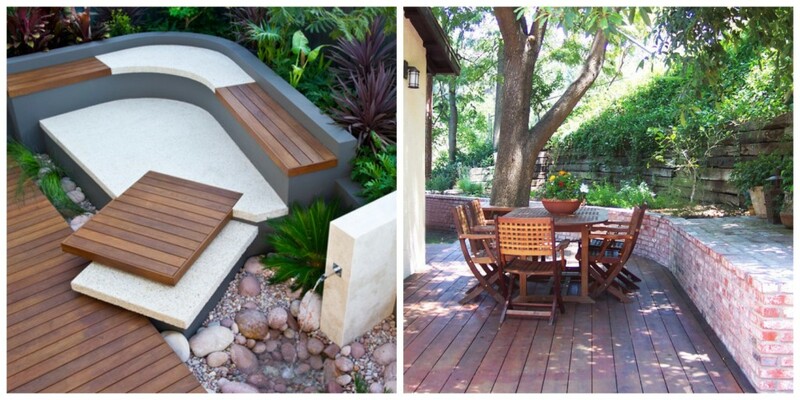 In-ground, above-ground, lap pools, spas and water features all add to the enjoyment of an outdoor space. Water can be calming – for example, we have two ponds that attract native birds and it’s quite peaceful to watch them drink and wash themselves. Living an outdoor life in Australia means enjoying and nurturing our surroundings. 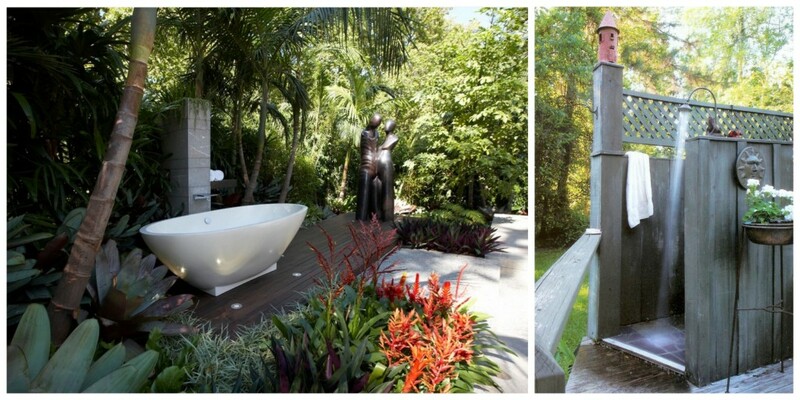 And one of the most indulgent ways to enjoy our outdoors, in privacy, is an outdoor bath or shower. Absolute bliss! If you have never bathed outdoors, you are really missing a treat. Having an outdoor bath isn’t the same as being in a pool or spa; it’s totally different. And showering amongst the trees is a beautiful experience. For luxury accessories such as fluffy towels, faux fur bath robes, and scented candles visit Pottery Barn. Sheer luxury. There are many ways of living an outdoor life and we cover lots of them here on Don’t Call Me Penny. What did you think of some of the ideas shown here? Do you have any favourites? Are there ideas here that you have tried? Do you have any tips for our other readers? How do you enjoy living the outdoor life? If you’d like to keep up-to-date with new posts on architecture, building, interiors, and outdoor living, please add this blog to your RSS feed. You can also follow me on Twitter, Facebook, and Instagram; I’d love to have your company. All images were sourced from Houzz.com.au. We are more than happy to include personal hyperlinks direct to designer websites. If your image is here please contact penelope@dontcallmepenny.com.au for inclusion. Unfortunately, image credits inadvertently were not gathered for this article.